Our primary aim at the Yorkshire Arboretum is the development and maintenance of the tree collection, helping to maintain genetic diversity in a global and national context. In doing so we also create habitat for wildlife that can find refuge here from the intensive agriculture in the surrounding countryside. In living memory the UK has seen a huge loss of wildflower-rich grasslands - over 97% have disappeared since the 1930s. This has had a major impact on our native pollinators – three-quarters of butterfly species are in decline and there have been significant losses of wild bumblebees. At the Yorkshire Arboretum we play our part in helping to reverse these losses by creating and managing large expanses of wildflower meadows. 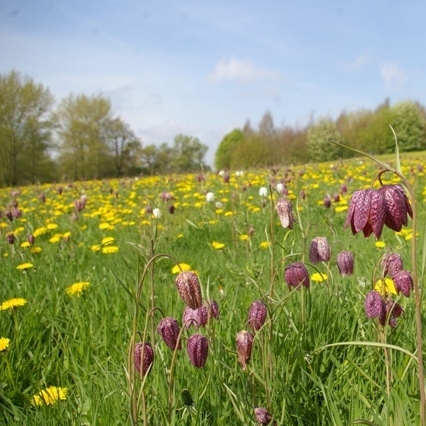 Our aim is to increase the number of wildflowers, thereby providing more food (pollen and nectar) for insects such as bumblebees, hoverflies, butterflies and moths. This also provides us with beautiful displays of flowers during the spring and summer months and, on sunny days, clouds of butterflies. The wildflower meadow creation at the Yorkshire Arboretum is part of the Buglife "Restoring Ryedale's Lowlands Meadows" project made possible through grant awards from the SITA Trust and The Waterloo Foundation which enable the harvesting and purchase of wildflower seed and plants, plus the physical works required to restore and create our wildflower grasslands.